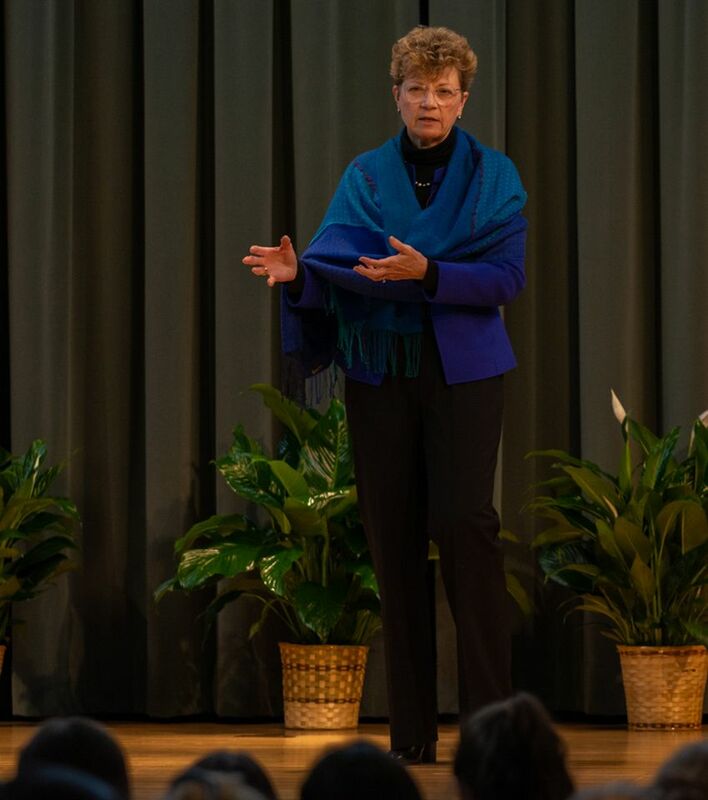 Ann C. Phillips, Retired Rear Admiral and former Chief of Naval Operations’ Climate Change Task Force, visited Chatham Hall January 16 & 17 as the 2018-19 Polly Wheeler Guth ’44 Leader in Residence. Phillips started her time on campus meeting with students in large groups - engaging them in dialogue about her work understanding and battling climate change, as well as encouraging discussion about her experience as a Surface Warfare Officer in the United States Navy. During her career, Phillips played an instrumental role in the development and implementation of the Navy’s adaptation to climate change. She has since focused her energies on climate change and its impact on national security, chairing the Infrastructure Working Group for the Hampton Roads Sea Level Rise Preparedness and Resilience Intergovernmental Pilot Planning Project, convened by Old Dominion University. Chatham Hall is fortunate to welcome Ms. Phillips to campus as the school adopts the United Nations Sustainable Development Goals, which include climate action; life on land; peace, justice, and strong institutions; as well as partnerships for the goals. Ms. Phillips’s wealth of knowledge on questions of national security and her work as a private consultant on matters of climate change as they relate to defense of the United States will engender deep and thoughtful conversation on topics in which Chatham Hall students have expressed great interest and which impact their lives on a daily basis. During her 31 years of active duty, Phillips served in every warfare group of the Surface Navy: Destroyers, Aircraft Carriers, Amphibious, and Replenishment Ships. She commissioned and commanded USS MUSTIN (DDG 89), and commanded Destroyer Squadron TWO EIGHT, and Expeditionary Strike Group TWO – which included all the Amphibious Expeditionary Forces on the East Coast of the United States. Ashore she was a Senior Fellow on the CNO’s Strategic Studies Group XXVIII and managed requirements and resources for the Surface Navy as Deputy Director and Director of Surface Warfare Division (N86) in the Pentagon. Upon retirement from the U.S. Navy in 2014 she pursued her MBA at The College of William and Mary, Mason School of Business, graduating in 2016. During this time she also chaired the Infrastructure Working Group for the Hampton Roads Sea Level Rise Preparedness and Resilience Intergovernmental Pilot Planning Project convened by Old Dominion University. The Leader in Residence program is endowed by the Polly Wheeler Guth ’44 Leader in Residence Fund and brings exceptional female leaders to the Chatham Hall campus.